From bottles and supermarket bags to chairs and computer monitors—plastic is everywhere! So where does plastic come from? Plastic comes from organic products such as crude oil. Crude oil goes through a distillation process in an oil refinery and 2 main polymer groups which are thermoplastics and thermosets. Thermoplastics are the ones that are produced overly, used constantly. On the other hand, thermosets are plastics that cannot be undone. With all of these plastic, there should be a place where they all go when it is used. According to The Atlantic, out of the global solid waste composition, 10% is plastic. We often use PET bottles and plastic bags because they are cheap and easily available. Now, where do they go? What do we do? Recycle! Recycling plastic is very handy and helps a lot when we reuse the material. It helps in our environment and that is what we want especially because plastic are non-biodegradable because it does not decompose. Hence, we need to act upon this issue. In Sri Lanka, recycling is not mandatory, unlike other countries. It is hard to recycle because you have to go to the recycling shops and sell your things. In Colombo very few of the recycling/scrap shops recycle plastic. The recycling shops that do accept plastic waste only allow high-grade plastic. This may be because of the cost of it. It is more valuable than PET bottles or shopping bags. The average cost of high-grade plastic is 10 LKR per kilo while the average global cost of plastic is $50 per pound (source). Compared to other recyclable materials and from the average global cost, it is cheap to sell plastic here. These recycling shops then sell it to other countries like India and the recycling process is done there. It cannot be done here because we learnt that the Sri Lankan government does not support recycling. Therefore, we should partake in recycling plastic! Little things can make a huge difference. When we just separate plastic from other materials, it will be easier for the recycling shops to organize the materials and segregate them. We can also implement using paper bags instead of plastic bags because plastic does not decompose. Freudenrich, Craig. “How Plastics Work.” How Stuff Works. N.p., n.d. Web.12 Mar. 2014. “Green Insider: The Truth about Plastic Recycling.” Atlanta INtown Paper. AtlantaINtown Paper. N.p., n.d. Web. 11 Mar. 2014. “How Plastic Is Made.” The Plastics Portal. N.p., n.d. Web. 12 Mar. 2014. Thompson, Derek. “2.6 Trillion Pounds of Garbage: Where Does the World’s Trash Go?” The Atlantic. Atlantic Media Company, 07 June 2012. Web. 09 Mar. 2014. Recylcing OSC”s paper & cardboard near the cafeteria. Ranjit, OSC’s truck driver (on left), has been assisting our activity for the last six years and plays a key role. Our waste: garbage, do you know where it goes? If the garbage stays in our homes for a while we tend to get irritated by the smell, but as the garbage is taken and dumped some other place, we are relieved. However, we don’t know the impact it has on the environment. Hence, we wait for the municipal government to address this issue. It’s unimaginable for the government to do something about this without our cooperation. The hard reality is that we are now generating more garbage than the earth’s system can handle. Thus, every citizen is responsible to address this issue. Usually people neglect to notice this big problem and fail to realize that saving the plant also has a commercial side that we can benefit from. The average paper consumption per capita in Sri Lanka is about 7 kilograms per person of which only an inadequate 2 kilograms are collected for recycling based on a research carried out by, Geocyc ((Private) Limited). In the Western Province of Sri Lanka 7% of all garbage collected is paper which adds to the astounding 280 tons of paper per day, throughout Sri Lanka. Almost all commercial offices and homes burn or dispose paper by dumping it as garbage, waste paper is collected and sometimes it’s recycled, but unfortunately usually the paper is burned causing a cycle of exponential growth into damaging the environment. We cut down trees that reduce the carbon dioxide emission to make paper and then burn the paper to produce more carbon dioxide, we damage the environment on every step and contribute into the production of greenhouse gases. However, there is a solution, reduce, reuse and recycle. To decrease our impact on the environment, we must reduce our usage of paper, if we can’t do that we can reuse products and if that we can’t do, we must recycle. To increase paper recycling in Sri Lanka Geocyc helped in the creation of the recycling industry in Sri Lanka and other foreign trade routes for recycling. Thus, adding the commercial side to further promote paper recycling. 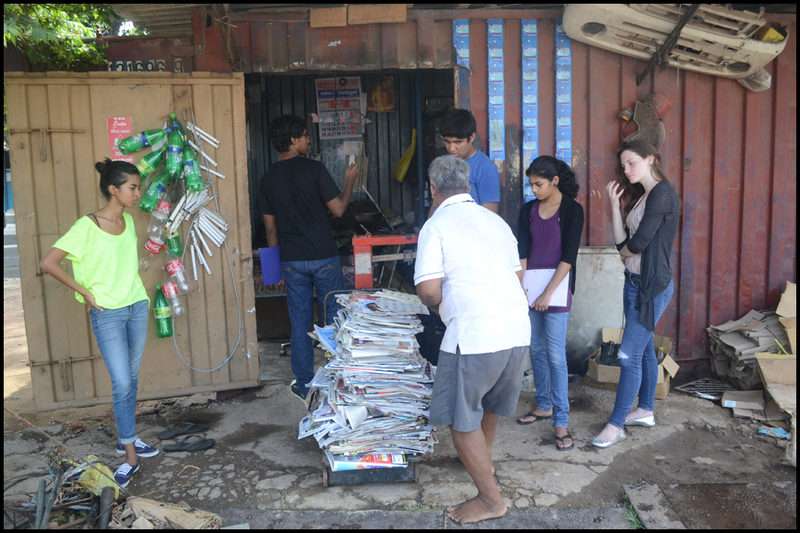 To evaluate the paper recycling in Sri Lanka during a geography class, we collected data from three locale scrap recycling yards, about the recycling of paper in our local neighborhood Battramulla, Colombo, Sri Lanka. 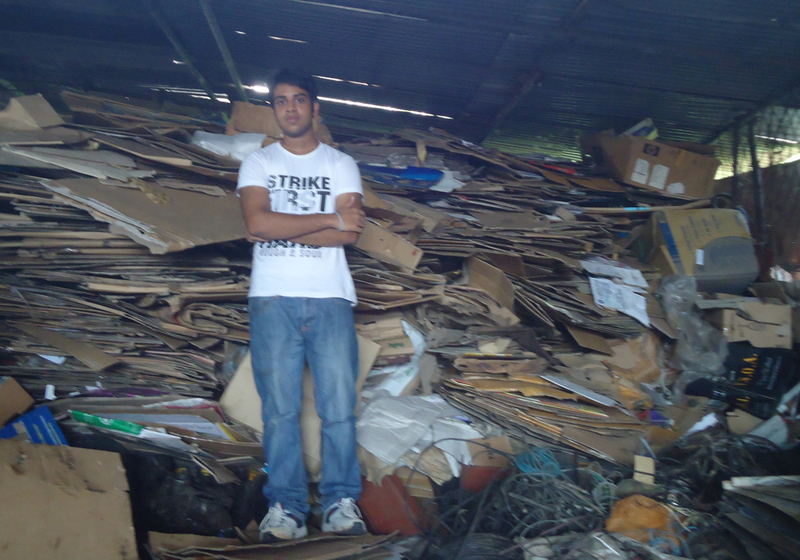 In one of the hub scrap recycling yards of Batramulla, Colombo, we discovered that they receive approximately one ton of cardboard in a week and one ton of paper in a month for recycling. To contribute in recycling of card board and paper, one receives ten rupees per kg of card board and paper. The local scrap yard hub then sends the card board to a company that sends the recyclable material abroad. 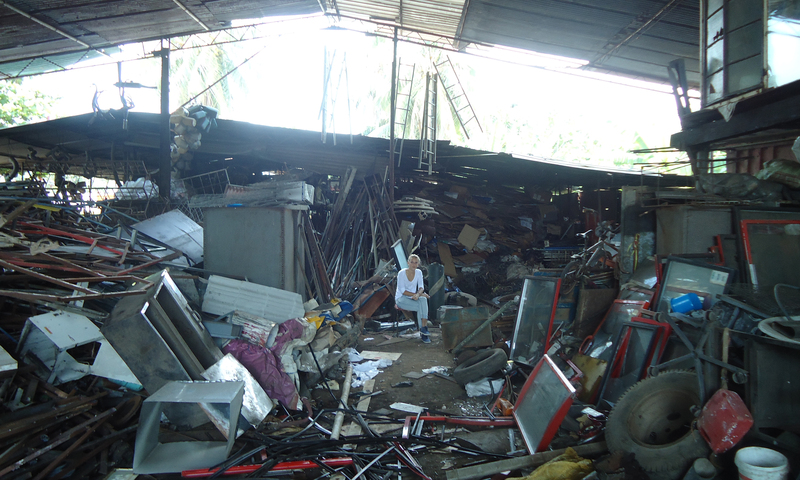 Then, the recycling scrap yard hub makes a 50 percent profit by selling card board and paper for 15 rupees per kg. 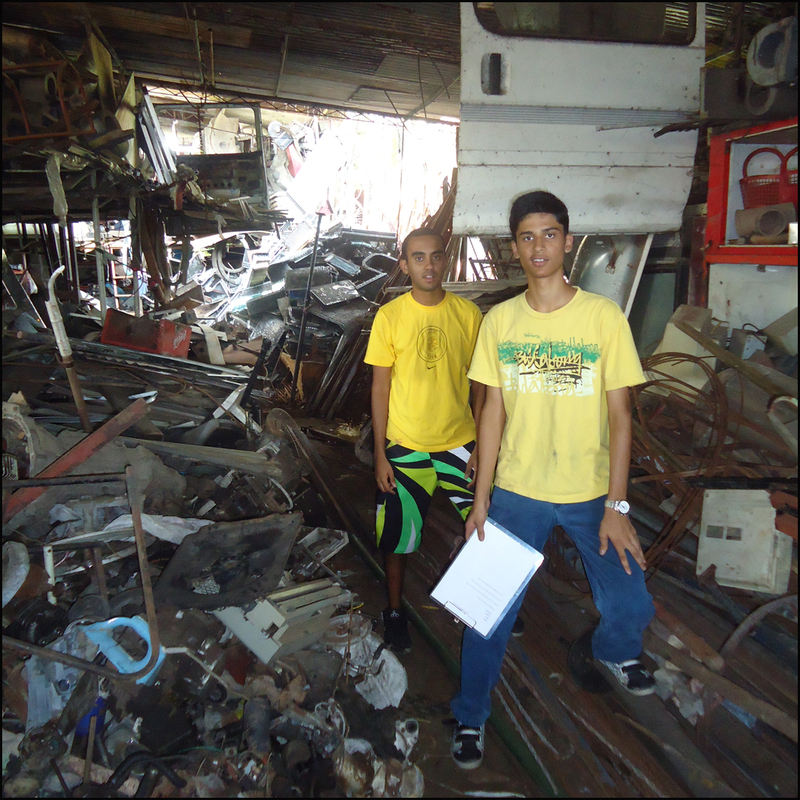 After collecting the data from the hub scrap yard, we then went to evaluate one of the branches of the hub scrap yard close to our school. Most of the procedures were similar to the Hub scrap yard except they bought paper for 5 rupees per kg while the hub bought it for 10 rupees per kg. The sub branch bought paper much cheaper than the hub. To get an even more precise data we then went to evaluate another scrap yard, there the manager bought paper and cardboard for 10 rupees per kg and he got 3 tons of card board and paper monthly and sells it at 14 rupees per kg. From the data, we know that if we recycle 1 KG of Paper we save the environment of 900 grams of Carbon Dioxide and 850 grams of Methane and we earn 10 Sir Lankan Rupees and by recycling 1 KG of Cardboard we save the environment of 1,000 grams of Carbon Dioxide and 950 grams of Methane and we earn 10 Sir Lankan Rupees. Per capita used paper in Sir Lanka according Levien van Zon’s article is 200 Kg of paper and cardboard. Which indicates that that if all of the paper was recycled (200 KG) we save the environment of 19000 grams of Carbon Dioxide and 170000 grams of Methane and we earn 2000 Sir Lankan Rupees. Form this evaluation I didn’t only learn about the commercial side of recycling but also saw how much stuff we use and then dump as garbage, while we can recycle, get paid and contribute into making the planet be more sustainable. The further I evaluated the paper recycling, I wondered why are we not recycling more it is beneficial to everybody and everything. “Garbage in Sri Lanka.” Garbage in Sri Lanka. N.p., n.d. Web. 31 Mar. 2013. Environment, Programme. “Reducing Our Waste the 3R Way.” Reducing Our Waste the 3R Way. N.p., 28 June 2009. Web. 31 Mar. 2013. “GEOCYC (PRIVATE) LIMITED.” Welcome to Geocyc. Lanka E-Marketing, n.d. Web. 25 Mar. 2013. “The.CO2List.org.” The.CO2List.org. N.p., n.d. Web. 31 Mar. 2013. Weighing paper at the nearby scap dealer. Note the plastic PET bottles that he has collected. Generally it has been difficult to find buyers for OSC’s plastic waste. “The island has long had people who buy old bottles and newspapers. Collecting old iron has also become a lucrative business to some. These lines have the reason behind the result we got from the study done about plastic recycling in Pelawatte area. Recycling has been a major issue in the current time because the waste coming from the products we consume are leading to environmental problems such as global warming. People are being increasingly aware of recycling and mostly everyone is recycling newspaper. But has anyone thought about what happens to the plastics we consume? Plastics are a part of our daily life because water bottles are made of plastics, milk cartons have some amount of plastic and the plastics cans that are been used. Where does this plastic go? How much waste plastic do we produce and how much this plastic is being recycled every day? These are some of the questions that people don’t think about. Recycling newspapers isn’t the only way to help the environment. Most of the environmental problems are caused because of the non-decomposable plastic that has been left in the environment (Recycling).The study we did in the Pelawatte area showed us some big issues which aren’t being solved. We saw that out of 3 only 2 recycling centre collected plastics but only 1 didn’t heat it up whereas the other one did. Heating up the plastic releases hazardous materials in the environment and polluting it. When asked for the reason for not collecting plastics there were 2 major reasons. First, that plastics are hard to process. The plastic recycling centres have to go through a hard step-wise-step process of separating, washing, shredding, identification and extrapolation process (Plastic). Second, there aren’t high demands for plastics compared to metals. This connects to the quote provided above. Why aren’t there enough demands for plastics? The reason is because people don’t know that there is money in waste plastic. But still there are some people who sell plastic to these recycling centres. Now the question that arises is that, what happens to the plastic that is brought to the recycling centres? The answer is, either they are burnt off polluting the environment or taken to Wattala, but none of the recycling centres we visited know what happens to the plastic that is taken to Wattala. One of the recycling centres said that some of the plastics in their recycling centre is burned off or sold to people who want to buy plastic cans. They sell small plastic cans for Rs.8/can and the bigger cans for Rs.40-50/can. What got our mind confused was, why do they have such high difference in the prices even though the cans weren’t that different. Looking at all the data we got we can conclude that there is a lot that has to be done regarding plastic recycling. We have to start off by making people aware of the benefits of plastic recycling and how much money that the recyclers are willing to pay (Jayawardena). Second, we have to look at what happens to the plastic that is taken to Wattala. We have to aware the people of the problems caused by burning the plastics. The final thing that we need to look forward is to atleast helo in the process of recycling. We know that recycling plastics is a hard process but if we can separate the plastics that have to be recycled we can contribute to recycling of plastic recycling (Jayawardena). Article Copyright Varsha Muraleedharan, 2013. Jayawardena, Niranji. “Sri Lanka Promotes Waste Plastic Recycling – LANKA BUSINESS ONLINE.” Sri Lankav Promotes Waste Plastic Recycling – LANKA BUSINESS ONLINE. N.p., 3 Nov. 2007. Web. 29 Mar. 2013. “Recycling Is a Major Issue for Us All.” Skip Hire London Recycling Is a Major Issue for Us All Comments. N.p., n.d. Web. 29 Mar. 2013. “5 Stages of the Plastic Recycling Process.” Free Press Release Distribution Service. N.p., 27 Oct. 2011. Web. 29 Mar. 2013. Waste not, want not… are we doing enough to recycle paper at OSC? Less is More! Whether it’s money, makeup or just plain paper, we are often advised by our teachers and parents to use only that what’s required. Of the three, it’s paper that’s the true, constant companion in our lives as students. We use paper to write on, paper to draw on, paper to print assignments, paper to make cardboard boxes for storage and then… discard it!It’s significant role in our lives ends as a crushed ball in a bin. Is it not strange that we are not curious as to its origins? So, where does this paper come from? Paper, first introduced by the ancient Chinese, is a nonrenewable resource unless it is recycled. The primary source of most of the paper that we use is the wood fibres of trees and plants. Wood fibres are converted into pulp using water and energy to make paper. Yet another source is recycled wood fibres obtained from used paper. It is worth noting that “By treating waste as a resource, the reader will save money and better the environment,” (Dave, Lillian Brummet) for the more paper we use, the more is wasted and more trees have to be cut down. In educational institutions like OSC, paper is a significant resource not only for students but also for teachers, the Business Office, and the IT labs. In 2010-2011 alone, OSC used 900,000 sheets of A-4 Size Paper at an annual cost of US $ 7525; the IT departments lead the consumption estimate at 75 – 80%. This means that with a monthly cost of US $ 637 and thus, a daily cost of US$21 per day, OSC’s expenditure on paper is four times more than the per capita income of daily wage workers in Bangladesh, and the administration, keen to reduce expenses , follows a two pronged environmentally friendly strategy : reduction and conservation. Principally, its strategy is to reduce paper consumption. According to OSC Accountant Suren and PRO Dharshana, the Business Office has launched an initiative to reduce usage by replacing hard copies of printed financial reports with soft copies of CDs. Usage of recycled paper is limited in OSC as recycled paper cannot be used for printing purposes although the school does encourage the use and sales of reasonably priced recycled paper greetings cards during the festive season. Furthermore, to improve OSC’s resource conservation strategy, Suren Rajadurai and Dharshana Abeysekera proposed the continuation and implementation of practices like replacing paper with CD’s and the emailing of assignments to and by teachers. Moreover, to raise awareness amongst students, OSC has a community service programme whereby waste paper and cardboard is sold to recycling centers and the revenue is used to purchase recycling bins that are strategically placed around the school. Recycling centers, and there are a few in the city, buy used paper, and OSC sells used paper waste to one such center located on the parliament road. The profit, that the recycling center on the parliament road makes was compared with that of another recycling center in Pannipitya, and were approximately the same. The center has been in operation for the last 10-15 years: recycling paper, cardboard, plastic, glass and aluminum. For the purpose of this article, we shall focus on waste paper and cardboard. Investigations reveal that while waste paper, from India and Kandy, is recycled locally, waste cardboard is exported to India to undergo recycling by being boiled in water at high temperatures and converted into pulp, which is then dried. Waste has been recycled for reuse. This is then imported back. Thus, the center buys the waste at Rs. 8/kg – a pittance and sells the recycled product at Rs. 11/kg. To ensure efficient recycling and maximize profits, the center also keeps abreast of new and innovative recycling practices. According to the manager, “We try to attend international conferences in Watalla, near the airport, to update our current methods of recycling and aim to diversify and increase the amount of materials that are recycled, from plastic to printer cartridges.” Discussions with the manager reveal that since there is minimal government support in the form of subsidies, the center’s recycling aim is guided more by profit and less by a love for the environment. However, in spite of the purely profiteering mindset of the center’s administration, there is evidence of a consciousness of ecofriendly habits and a demand for recycling amongst the population in Colombo. This awareness is heartening as it shows that all is not lost yet, that there is a conscious effort amongst the old and young alike to preserve and conserve the environment. In initiating a recycling programme targeting the youth and a concerted action plan based on technology, OSC has shown that it cares for the future of the world and the environment. So has the environmentally friendly population in Colombo through their waste recycling awareness. So have the recycling centers although their motives are slightly skewed. But is this enough? Should it not be an approach of “Waste not want not?” sustainability and use only what is absolutely required if our children are to inherit a green world? Let us not have it on our consciences that for every sheet of wasted paper, somewhere, someplace a tree is being cut down … a tree that has taken years to grow but only seconds to die! 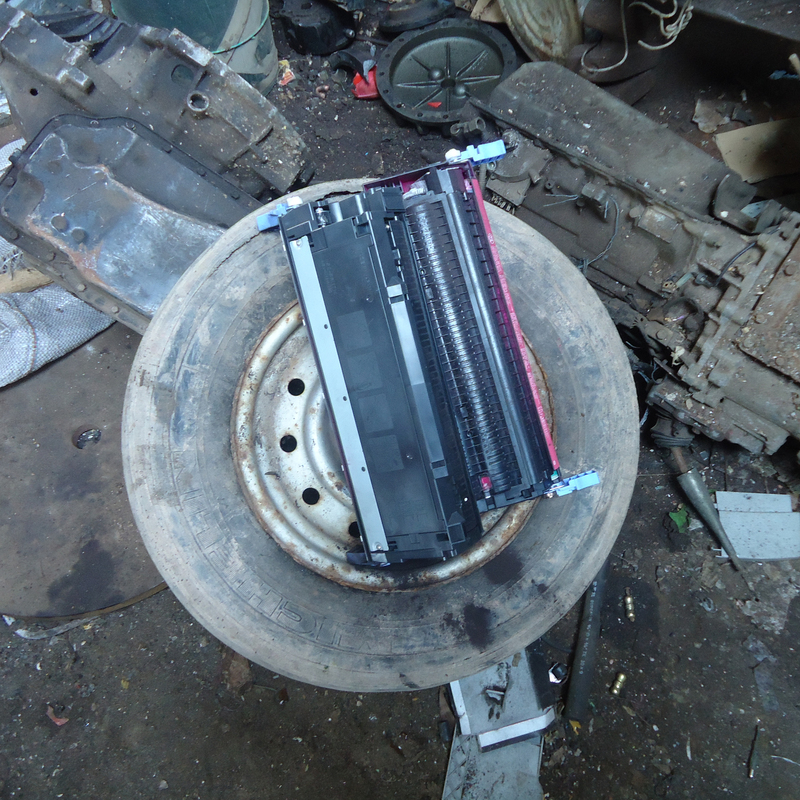 Printer cartridge at the Battaramulla Recyling Center…awaiting an uncertian future. Cartridges are often overlooked as a possible recyclable item. Local collection centers will collect cartridges for their raw plastic, rubber, paper, metal and foam value. A more effective way is sending cartridges off to Recycle4Charity or similar nonprofit organization, where you will be paid up to $15 for laser cartridges. When we think of recycling we usually think of three things: paper, glass and plastic. Sure, it’s important to make sure to chuck last weekend’s Sunday times or the cola bottle into the recycling bin but everyone’s doing it these days. Recycling paper, plastic and glass has become so mainstream that no one’s missing out on this chunk of the green revolution …or that’s what they are fooled into thinking. In fact, we miss out on all the minute amounts of plastics, paper and glass materials that are in items that are made from a combination of these things. For example, printer cartridges are widely overseen as a material that can be recycled. This is bad. If neglected, the pollution and costs of discarded and newly manufactured printer cartridges can become a huge problem, just as paper, plastic and glass came under our radar in the recent past. The other possible option is where the printer companies (HP< epson etc.) themselves or non-profit organizations take in the printer cartridges to remanufacture them. This is probably the best option. In this second option, one collects the printer cartridges and sends them to a nonprofit organization or the printer cartridge company itself that will remanufacture it for you. Normally, when a Printer/computer company takes in the items they do not pay you but a non-profit organization will as they sell the items to remanufacturers and they receive money. The money they receive is used to pay back the donors for the used cartridges and used to give back to charity as most of the nonprofit organizations are for charity, such as the Recycle4Charity organization. When we manage fix the linear system that goes from factory to store to printer to landfill can we stop worrying about cartridges becoming a problem we can’t handle. Basically, companies like Recycle4Charity and local collection centers help transform our linear system of consumption into a circular one, where minimum waste exits the system, minimum resources are exploited and minimum energy is spent. Most of our electronics, including printer cartridges are designed to be thrown away, they are planned to be obsolete because this is good money for the capitalist. But, with a little help from you and me and a will fight to get back our planet from the capitalists, we can make planned obsolescence unplanned existence. 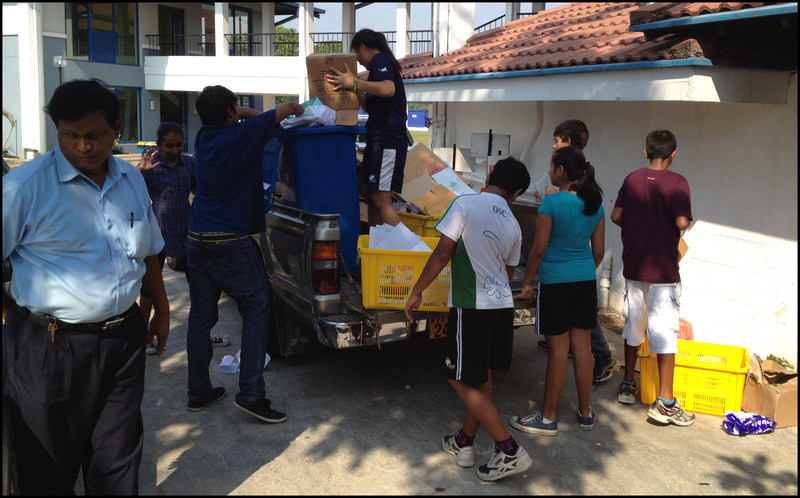 The Overseas School of Colombo collects printer cartridges for recyling so send yours in if you have empty ones at home! “Made in China.” C7115A Toner Cartridge for Laserjet. Web. 25 Mar. 2012. “SAVE on Printer Ink!” Printer Ink. Web. 29 Mar. 2012. The New York Times. The New York Times. Web. 29 Mar. 2012. “UsedÂ EmptyÂ InkjetÂ CartridgesÂ HPÂ 21,Â 22.” Used Empty Inkjet Cartridges HP 21, 22. Web. 27 Mar. 2012. Plastic is a material that can be, and should be recycled. Knowing that our planet is now beginning to run out of resources, we should instead of wasting them, begin to recycle more and think more economically friendly. Our IB Geography class from The Overseas School of Colombo made visits to the nearby collection centers to see and learn about recycling in Sri Lanka. We were introduced to the different types of recycling that take place especially in our surrounding community. Once we walked into the large mess of different collected recycling materials I straight away noticed that majority of it was metal. Plastic did not strike out, and clearly was not one of the main materials to be recycled. After asking questions and interviewing the workers, we found out how the collection business works. Plastic recycling is a process where used up plastic is collected and separated to the different plastic types. From here, they are later melted or reprocessed into useful products. The collection centers only process the materials and then later forward them to recycling instances where it is reused rather than thrown away. The centers profit from this as they sell the plastic for a higher rate than what they get it for (buy for 25rs/kg and sell for 35rs/kg therefore profiting 10rs/kg). Individual people and companies, both, bring in recycling material that the collection centers pay for. Sri Lanka imports 160,000 tonnes of plastic raw materials each month (Sri Lanka News).This is not as much as in some countries in South Asia, but it is believed to increase in the future as Sri Lanka is to develop. The collection centers are very specific on what they take in to be recycled. We found out that for instance plastic bags and small plastic items were not accepted by the centers. What was accepted were big plastic containers, plastic bottles and other preferably hard, big sized plastic objects. The collection centers being so particular in what they accept to be recycled, does not therefore solve the issue of trash and pollution on the streets and around us. The smaller pieces of plastic that are not being recycled as a result end up burnt or buried underground polluting the environment. Recycling plastic is not popular in Sri Lanka just yet, but may and should be in the future. It benefits our planet as well us in the long run, so why not help now? “Sri Lanka Promotes Waste Plastic Recycling – LANKA BUSINESS ONLINE.” Sri Lanka News, Economy and Business from Lanka Business Online. Web. 26 Mar. 2012.